Recorded at different venues listed below. From November 2002 to March 2003, The Sixteen are embarking on a 17 venue tour round the UK, performing at a series of major cathedrals. For this tour, which started on November 22nd 2002 at St. Giles Cathedral, Edinburgh, the Sixteen commissioned James MacMillan to produce a setting of "O Bone Jesu", a text set by the 16th century Scots composer Robert Carver for performance in the King of Scotland's private chapel. The programme on this CD is the same as the programme that The Sixteen are touring but only the MacMillan and the Ramsey motets have been newly recorded. The remaining items are taken from the excellent recordings on Collins Classics (now deleted) originally issued in the 1990's. Robert Carver probably wrote his mass "Dum sacrum mysterium" for the coronation of the young James V son of James IV, for whom "O Bone Jesu" was written. James IV was killed at Flodden field. James IV established the Chapel Royal in 1501, based at Stirling Castle and our knowledge of its repertory comes from a choir book which is believed to have been compiled by Robert Carver. Besides the Carver's own music, the choir book includes a mass by Dufay, the Cornysh "Salve Regina" recorded here, as well as a number of other works which also occur in the Eton Choir book. (A parallel which possibly occurs thanks to Margaret Tudor, the English wife of James IV). The recital opens with the plainchant Magnificat antiphon "Dum sacrum mysterium" on which the Carver mass is based. The Scots Chapel royal had 22 members when first set up. So their performances of the 10 part mass must have used numbers similar to The Sixteen. Carver's credo setting is wonderfully refulgent music. His remarkable "O Bone Jesu" in 19 parts is used to conclude the recital. The words come from the Devotion of the Name of Jesus, a ceremony performed after Compline. The text is penitential, something accentuated by the use of the first person singular. The resonantly elaborate music was not in fact for public spectacle, but was intended to form a backdrop to the private devotions in the King's chapel. Carver handles his multiple parts with complete confidence, making one wonder what other gems were lost during the Reformation. Carver likes to contrast sections with differing textures, so that solo sections follow full choir sections, homophony is followed by complex textures. The result sounds magnificent live, but must be a conductor's and record producer's nightmare. On these recordings the soloists are recorded quite closely and an admirable attempt has been made to retain a degree of clarity in the complex concerted sections. But I feel that this has been done at the expensive of the evocative atmosphere of hearing the work live. Perhaps a case could be made for including two versions of these pieces on one disc, one recorded close and one distant. Also, the sound quality is rather too soprano led for my taste. If you listen to the Capella Nova performances of the works on ASV, then you get an entirely different experience. The sopranos are more integrated into the body of the choir and the basses and lower parts are more prominent. I prefer this sort of balance, but this is a very personal thing and with such fascinating music there is never going to be a single correct way of doing things. Alan Tavener and Capella Nova take a more robust view of the works and I rather like the effect but The Sixteen perform both Carver items with an admirable combination of vigour and clarity. To their credit, there are remarkably few hints of instability and tuning problems that I associate with performances of these taxing works, they sound as if they have been singing them all their lives. James Macmillan's "O Bone Jesu" uses many of the devices that can be found in Carver's setting, alternations of complex and simple textures, homophony and polyphony, soloists and full choir. But he clothes them in his own distinctive and evocative musical language. Rich, widely spaced chords are used in full choir to point up the occurrences of the name 'Jesu'. Out of these chords arise filigree textures of soloists embroidering complex musical lines. The resulting work provides and admirably contemporary view of the devotion to the Holy Name embedded within the text. The Sixteen give a confident performance of this sonorous work. Only at the outermost reaches of the voice range did I feel that they were slightly wanting. The lowest basses seemed to be rather under-powered in some of the rich chords, and the final stratospheric soprano line could have been quieter. But these are small points. The composer was present at the recording sessions and can rightly be pleased with The Sixteen's assured rendering of his work. The items by Robert Ramsey come from a set of part books now in the Euing Collection of the Glasgow University Library. These part books are almost certainly in the composer's own hand. Ramsey may be related to Scots trumpeters who came to London with James VI/I in 1603. But Ramsey is mainly associated with Trinity College, Cambridge where he was organist and master of the choristers until his death in 1644. This is not common fare, but the sound world is more familiar than that of Carver. On this disc the first motet, "When David heard" comes as a bit of a shock after Carver and Macmillan. The choir do not make enough of the English words. Ramsey's setting of "When David heard" makes a useful alternative to the more familiar sacred madrigal by Weelkes, but Ramsey does not manage to tug the heart strings in the way that Weelkes does. There were two William Cornyshes active in London in the late 15th and early 16th centuries, probably father and son. There has been some dispute as to which one was responsible for the Latin sacred music preserved in the Eton choir book. Current scholarship favours attribution to the older man. The elaborate 5-part "Salve Regina" would have been performed as part of the nightly devotions in front of the image of the Virgin. The "Ave Maria", setting another votive text, is for men's voices only. 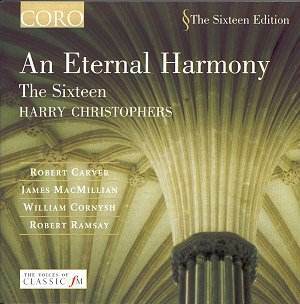 The Sixteen have done lot to make the music of the Eton Choir book better known, so it is very welcome to have these lovely performances back in the catalogue. The choir sing the music as if from long familiarity, shaping Cornysh's lines with a beguiling naturalness. The "Salve Regina" alternates full and reduced voiced textures, particularly striking are the sonorous sections for male voices only.